The most incredible almond croissant recipe, just like you would find at a French bakery. 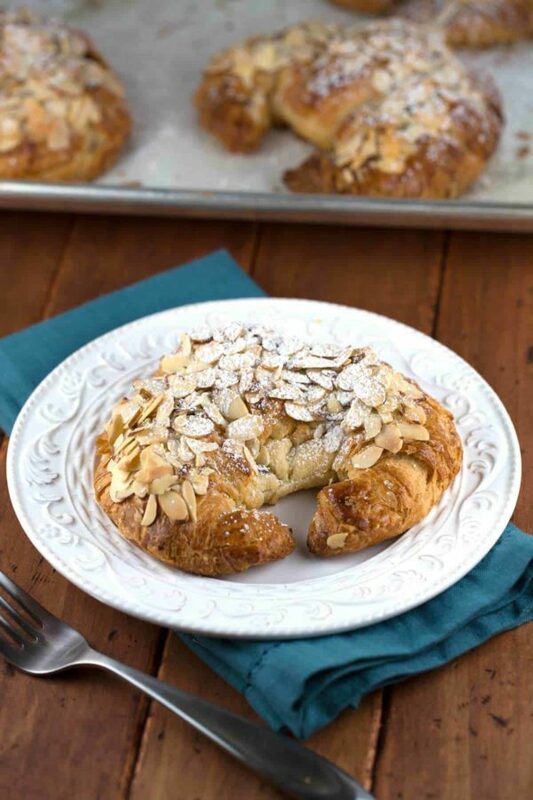 Flaky golden croissants are filled and topped with almond cream and sliced almonds. A delicious morning pastry to go with your favorite beverage. Hello! You have just stumbled upon one of my all-time favorite recipes, flaky, nutty, creamy almond croissants. These beautiful crescents are first made with lots of TLC to create all of the incredible laminated layers and then filled with the most luscious almond cream. Indeed, they are undeniable my culinary kryptonite. So where do all the poor croissant orphans go when no one wants them? Not to fear, they get a makeover and become even more awesome as tasty almond croissants! My favorite version of almond croissants is from Bouchon Bakery, the artisanal boulangerie created by the culinary mastermind Thomas Keller. He doesn’t just fill the inside with a smidge of almond paste, no way! Chef Keller creates a rich nutty almond cream that he generously supplies inside each croissant. Then if that wasn’t enough, he pipes the tops of each sweet butter pastry with more cream, oh yeah! Sliced almonds decorated the tops and baked until a crispy light golden brown, and the cream warm and custardy. It’s so amazing and addicting! Knowing that I have an obsession for pastries, my thoughtful Aunt Lynette brought me a whole box of almond croissants from Bouchon Bakery in Las Vegas during their first visit to see baby James. She certainly knows how to make a hungry mama happy! I was so excited to make this at home but also nervous that I might not be able to pull it off. When the Bouchon Bakery cookbook was published, I ordered one as soon as I could. I’ve been dying to replicate this almond croissant recipe, and I was ready to give it a go! I have to say, with just a few tiny tweaks it was so good, especially fresh out of the oven when still warm, oozy and crisp! Busy Mom Alert! I must admit something; I didn’t have the chance to make the croissants from scratch. My local bakery sold some gorgeous butter croissants, and I let them sit for a day in the pastry box. I didn’t cover the croissants in an airtight plastic bag or container because that will give the pastries more of a chewy texture instead of dry on the surface. It’s all about the almond cream filling! It’s a mixture of almond flour or meal, all-purpose flour, sugar, butter and eggs, that simple. The combination will rock your taste buds, especially since it’s piped in between each croissant like a sandwich, and then again on top and sprinkled with sliced almonds for more flavor and crunch. Make sure not to forget to make the almond syrup, it adds a little bit of moisture and sweetness to each bite, so don’t be shy when you’re adding it on. I decided to add just a little bit of almond extract to the syrup because I enjoy a good distinctive almond flavor and didn’t think the soaking of the almond meal alone would give it enough oomph. When the timer went off, and I opened the oven door for the first time, I was in amazement. I couldn’t believe how gorgeous and fragrant the almond croissants appeared, I was in heaven! I couldn’t wait to dig in, but I had just enough restraint to let them cool, top them with some powdered sugar and take a quick picture. Oh my, you have to eat them warm from the oven! I even let my son James who is 9 months old have his first croissant experience, he smiled with each bite, and I loved seeing the crumbles all over his face and hands. You will never go back to regular croissants again after you make this almond croissant recipe, trust me. Almond croissant, you are my food soulmate! Are you looking for more scrumptious pastries to make at home? Try my chocolate profiteroles or luscious dark chocolate salted caramel tart. Why is day old croissant used for Almond Croissants? Day old croissants are used because giving the pastries time to be exposed to the air overnight allows them to stale and dry out a bit more. This makes the pastries more stable for cutting, filling and re-baking the next day for your enjoyment. Avoid covering them in an airtight plastic container, because that will make them less crisp and chewier the next day. Combine the sugar, water, and almond flour in a small saucepan and bring to a simmer over medium heat, stirring to dissolve the sugar. Remove from the heat and let steep for 1 hour. Strain the syrup into a small bowl or covered container. Add ¼ teaspoon almond extract (if using), and stir to combine. Set aside until ready to assemble croissants. Sift the almond flour/meal into a medium bowl; break up any lumps remaining in the sieve and add to the bowl. Add the all-purpose flour and whisk together. Place the butter in the bowl of a stand mixer fitted with a paddle attachment and on medium-low, warming the bowl as needed, until the butter is the consistency of mayonnaise and holds a peak when the paddle is lifted. Sift in the powdered sugar and mix on the lowest setting until incorporated, then increase the speed to low and mix until fluffy, 2 to 3 minutes. Scrape down the sides and bottom of the bowl. Add the almond mixture in 2 additions, pulsing to combine and then mixing on low speed for 15 to 30 seconds after each one. Scrape the bottom of the bowl to incorporate any dry ingredients that may settle. Add the eggs and mix on low speed until combined and smooth, about 30 seconds. Transfer to a covered container. Press a piece of plastic wrap against the surface to prevent skin from forming. Refrigerate until cold, about 2 hours or place in the freezer until chilled but not frozen about 30 minutes. The cream can be refrigerated up to 4 days. Spoon the cooled almond cream into a pastry bag fitted with a ½-inch plain tip or large re-sealable plastic bag with the tip cup off (after filling). Spread the almonds in a shallow bowl. 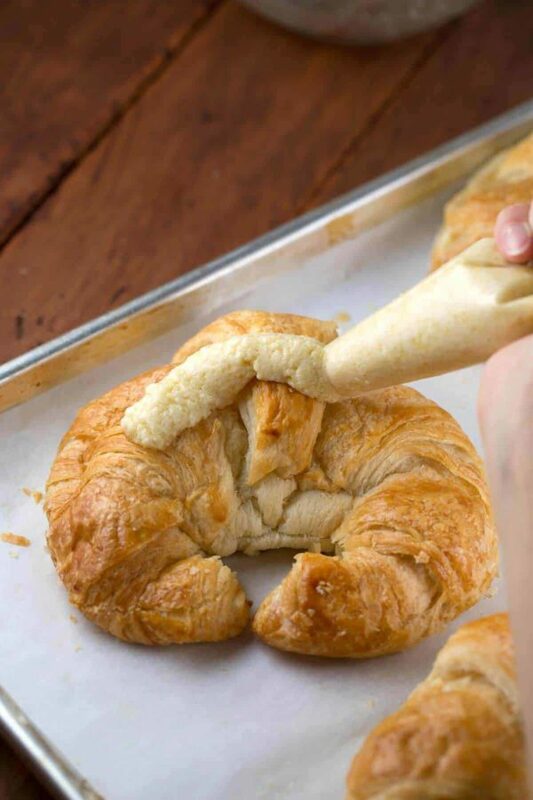 Cut the croissants horizontally in half, as if slicing them open to make sandwiches. Brush the cut side of each one with 1 ½ teaspoon of almond syrup. 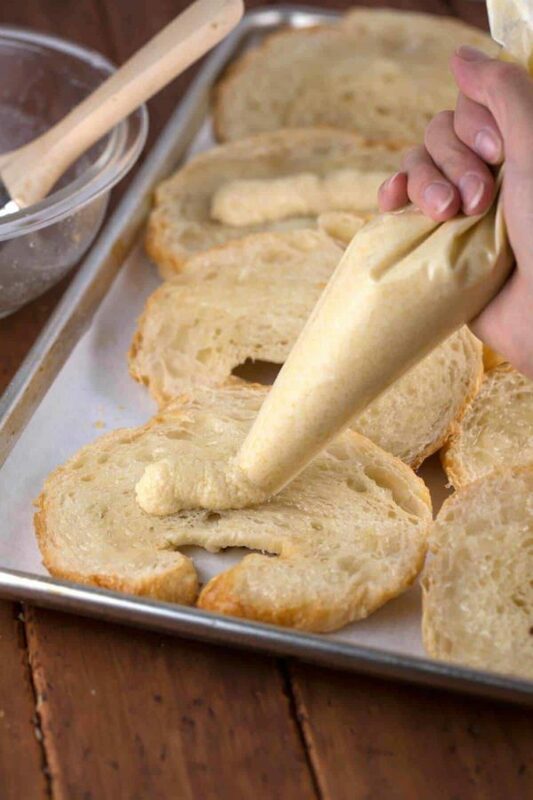 Pipe 2 to 3 tablespoons almond cream onto the bottom half of each croissant, and spread it evenly with a small offset spatula. Place the top halves back on and gently press together. Pipe about 2 tablespoons almond cream on top of each croissant and spread it evenly. If using larger croissants, feel free to add more almond cream into the filling and on top of the croissant (I like mine with a lot of cream!). Dip the tops of the croissants into the almonds, coating the almond cream generously, and press down to compact. Arrange the croissants on the prepared sheet pan. Bake for 15 to 20 minutes (depending on size of croissants), until the nuts are golden brown. Don’t worry if some of the almond cream drips on the paper. Set the pan on a rack a cool thoroughly. The croissants are best the day they are baked, but the can be stored in a covered container for up to 1 day. Almond croissants are my favorite: the more almond (paste) the better. I added 4oz almond paste, decreased the almond flour and butter, and they were to die for! Unless there’s a brunch party or a household full of guests I’m liable to eat…them…all. Your pics are beautiful. These look amazing! What are the sugar, water, and almond flour measurements for the almond syrup? That’s a great tip Kurtis! I will definitely try that next time, thank you! I’m really looking forward to trying this, hopefully this weekend. I’m a little confused about the eggs, though. Can you tell me how you’re getting “•¼ cup plus 2 teaspoons eggs”? Are you using an egg substitute that pours, or do you blend up a few eggs first, then measure? Is that supposed to happen? or did i do something incorrectly? Thank you so much in advance! 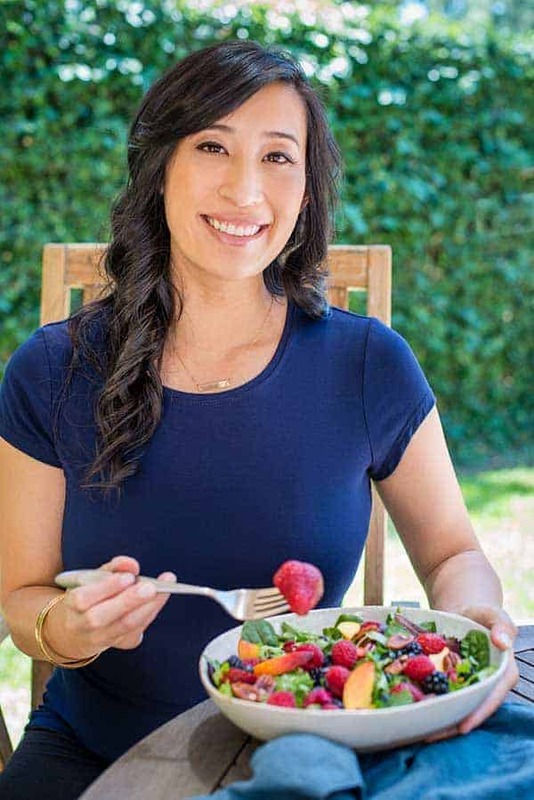 Love the website and the recipes! Wanted to be sure that, when you say to add the “almond mixture” in step 2 under “Almond Cream” that you mean the almond flour (dry) mixture and do NOT mean add all the almond syrup mixture! Pretty sure that would make things way too runny but…as I’ve not made these before… I thought it was worth asking! Thanks! Great question Tawnya! Yes, just use the almond syrup to brush the cut sides of the croissants. The almond mixture in step 2 is the combination of the almond flour/meal with flour. I hope that helps! Let me know how it turns out for you 🙂 I want almond croissants now! I went ahead with the recipe before your reply because I just couldn’t WAIT!!! ???? (thankfully doing it the correct way!) They were amazing! I’m actually getting ready to make them again right now! ???? I am an almond croissant – coholic…so thank you for sharing this yummy-licious recipe!! Mine turned out nothing short of heavenly yumminess!! Yay! We must be soul mates 🙂 I’m so thrilled to hear that your almond croissants turned out heavenly! I’ve been using the almond cream as a filling for cakes. Works well in a yellow cake with bitter sweet ganache frosting. Sometimes with additional fruit (cherry, raspberry) filled layers. That sounds Divine Bill! I will have to try that too! I’ve made this before and it is amazing, I came back again looking for the recipe but am traumatized is it really 992 calories for 1 croissant? I am hoping its for the whole recipe but I know that can’t be right either. I am still making it tomorrow and going to enjoy it but damn! Curious, is the 992 kcal for each croissant? 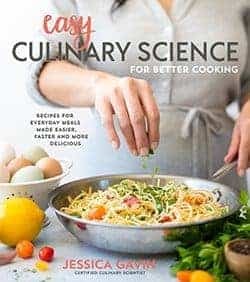 Thanks for the recipe Jessica! Almond croissants are one of my favorite desserts and this recipe is delicious! Looks like you use 4 large croissants but you list 8 servings. So each serving is only 1/2 a croissant and it’s 992 calories… is that correct? HI Tatiana- I haven’t tried making it by hand, but if think if you have the butter at room temperature and softened, it would not be too difficult to mix. For the warming of the butter, just make sure it’s soft but not melted. I usually leave it out on the counter for about an hour for so. You whisk the almond and flour separate from the butter, and then add to the butter mixture later.